“No Ramen, No Life” normally covers places where average folks eat, but we wouldn’t turn down an opportunity to check out a high-end restaurant. That’s what I did recently when I had lunch with my friend JB at the Tokyo branch of the world-famous Nobu. As some of you might already know, Nobu was founded by chef Nobuyuki “Nobu” Matsuhisa who is famous for his South American influenced Japanese cuisine. After working in a sushi restaurant in Tokyo, he moved to Peru in the early 1970s where he learned to adapt local ingredients for use in Japanese dishes. Nobu later moved to the United States where he eventually opened Matsuhisa in Beverly Hills, and then the first Nobu restaurant in New York City with friend and business partner Robert DeNiro. As part of its expansion around the world, the Nobu chain made its way to its namesake’s country of birth — Japan. 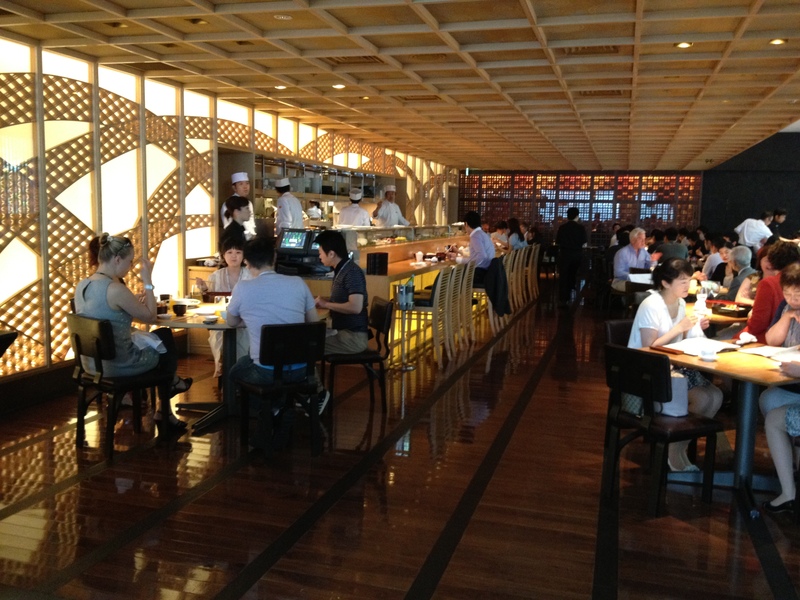 It was not easy to decide what to order because Nobu Tokyo has a sizeable lunch menu. I was tempted by the wagyu (Japanese beef) on rice, but I ended up getting one of the lunch bento boxes to get as broad sampling of what they have to offer. Each box (actually, it’s served in two long boxes) comes with a selection of sushi rolls, sashimi, a sashimi salad, grilled fish, another kind of seafood, and some kind of meat. The presentation was beautiful, but how was the food? 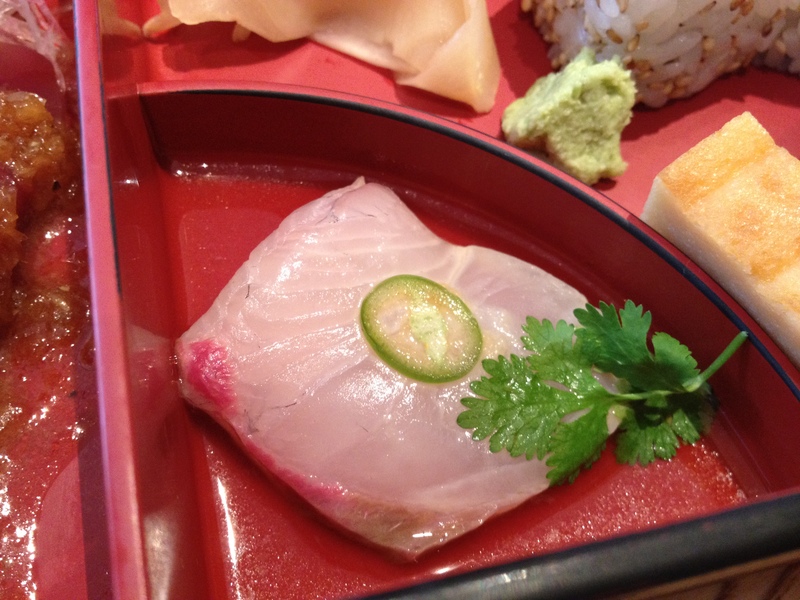 The one thing in the bento that best epitomized Nobu’s fusion cuisine was the single piece of bonito tuna sashimi in a transparent yuzu sauce and topped with a wispy slice of jalapeno pepper. It’s basically a combination of Japanese sashimi with Peruvian ceviche, but the use of yuzu instead of lime made for a less sour/acidic taste. It was very delicious and I wish I could have had more than just one piece. The larger sushi rolls contained tuna, salmon, avocado, and crab meat. The outside is wrapped in a thin layer of daikon radish. They were tasty, but didn’t jump out at me. There were also three California Rolls, which were basically just that. There was nothing wrong with them. It’s just that this was the first time I’ve had a California Roll since arriving in Japan and, after having had so many wonderful varieties of sushi here, I just felt that I haven’t been missing anything. The rolls are a core part of the American imagination when it comes to sushi, but even eating it Nobu, it reminded me of how much more there is to sushi. Next: the sashimi salad, which was really good. 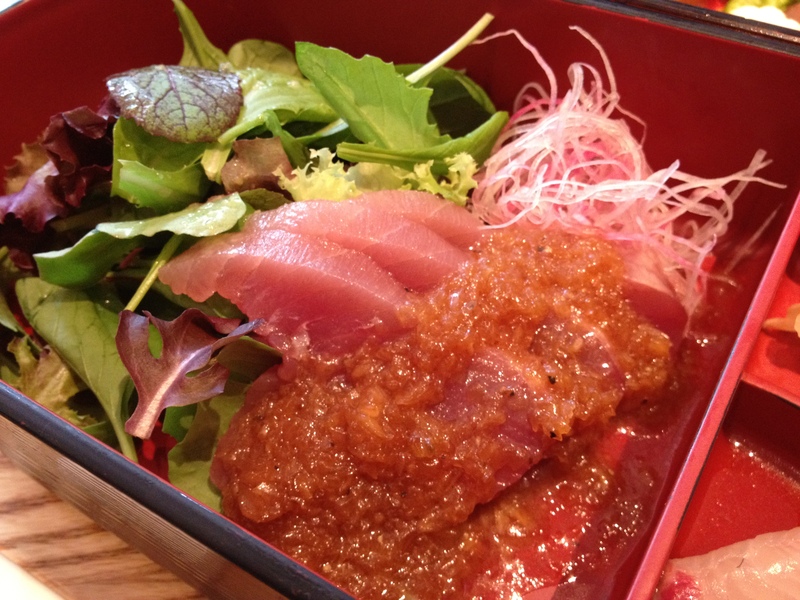 It was composed of a bed of greens in a yuzu dressing, topped with slices of raw bonito tuna, which were in turn topped with a cold shoyu-based sauce with grated daikon. It had a very nice and refreshing taste, especially on a hot summer day in Tokyo. The hot dishes were delicious too. The fried shrimp covered in a chili mayonnaise sauce had a delicate crunch and came with slices of radish. The pork was tender and served with a sweet sauce. The grilled salmon was a step above the standard grilled fish you would get at an average grilled fish joint in Tokyo. I was reminded that the lunch offerings, while tasty, were only shadow of what Nobu offers on its regular dinner menu. I will have to find an opportunity to come back for dinner at some point. 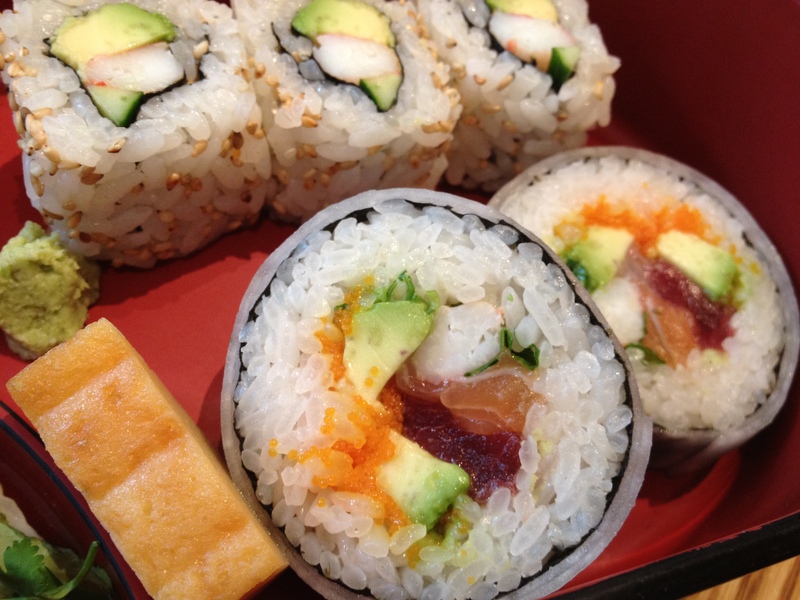 This entry was posted in Food and tagged Asia, California Roll, ceviche, Japan, Japanese cuisine, Nobu, Sushi, Tokyo. Bookmark the permalink.